Pros: The fact that we can customize the waiver to our likings and have 1 wavier set up to both accommodate single adult signer or adult signing for minors at the same time. I fairly enjoy the "Set Today" button but customers seem to not notice it. If there's a way to have the waiver to be default to Today's Date and allow customer to edit it otherwise should they wish to, it may be nice. Cons: The fact that we aren't able to separate minor's first and last names in the app. It defeats the purpose of using the app, which we used to prefer. Now we use the browser version of waiver and it gets laggy at times. Personally, I think the "Click to Sign" box is very self explanatory, but I'm putting this comment here because many signers seem to not understand that still. They'll put their finger in the box and start signing, which seems to make sense as well? So if there's anyway to clarify that language (more than it always does) to help, that may be helpful. Something like "Click for Signature Box" or something. Overall: At my VR arcade, every customer would need a waiver signed to play. WaiverElectronic's format is straightforward and easy to use so it helps our process a lot. Thank you for your review. The newest version of app supports the separate first and last names for minors. Please update your app to the newest version. Feel free to contact us if you have any questions. Pros: I really like how we were able to costum make it to fit our needs. I also love how it's electronic and I can send the link to anyone, anywhere and it can be completed. Cons: We've had a few problems when updates were made. We emailed about our concerns. The response time was relatively quick. Our concerns were addressed and fixed within a timely manner. You have to have exact spelling when searching for names. Sometimes our clients misspell. It would be nice to have it bring up a few more options (names close to the spelling that was input). Overall: It's nice to have everything electronic and easily accessible. Thank you for your suggestion. We will work hard to improve it. 2) I would like the ability to have an "other" option on a multiple choice question and if "other" is selected, I would like the option to have a mandatory field that must be filled in if other is selected. Overall: WaiverElectronic has allowed me to eliminate 90% of our business's printing. We have saved money and time with this app. It has also given me more options to have clients fill out forms at home and has helped ensure that minors have they parent/guardian fill out a waiver before coming in. Pros: I love the ease of using the program and having the app on my iPad to have clients fill out the forms. I also like being able to access it on my phone when I'm not in my Salon. Clients think it's super cool and easy to fill out as well. Cons: I would like to be able to edit and create forms on the app not having to go on to the site to do it. It is easy to make forms also! Pros: The back-end user interface, with drag and drop, is such a pleasure to use. Someone with little to no coding knowledge can set up a really professional looking waiver with ease. The support provided is also really good, with rapid response to my emails. Cons: A little restrictive in terms of its rigidity (A general problem with drag and drop)... but the support crew generally come up with a solution that does the job. Pros: I was able to customize it the way I wanted. Cons: Not easily searchable across devices. There is not one place I can see all of my waivers quickly as far as I can tell. Also, age limit is glitchy. SHould be able to sign waiver for ages 5 and up, but sometimes cuts people off even if child is above 5. Overall: More or less a good experience. GUI could be improved. Pros: We use this for our liability waiver for our range. 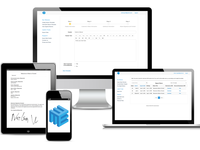 It has made life so much easier to be able to track and store the waivers electronically. Cons: I wish there was a module to link the info to QuickBooks POS vs 18. We just have to manually load the data weekly, not much of a problem. Pros: We went through many electronic waiver systems and selected WaiverElectronic because of it's functionality! We love that it has the option to renew a previously filled out waiver. Our splash page has never worked, despite having reached out to customer service, but we're still happy with the other all software. Cons: Our splash page has not worked and customer service was not able to solve the problem. Overall: Excellent. It was easy to set-up, looks great, and offers a lot of options! Pros: I run a small kayak business where I have customers sign a waiver before each trip. I love the offline functionality and the peace of mind that the google drive uploads bring. It makes it quick and easy on the beach and provides peace of mind that all the waivers are stored in the cloud. Cons: I do not like the splash screen where it has me select the correct waiver below. I only have one waiver and wish that it would just automatically load to that one. Cons: There must have been an update that limits name searchability on existing waivers, because we have been having a hard time finding the right people within the system to renew their waiver. Overall: Overall, the product and helpful customer service has suited our business needs. Pros: I like how simple this is to use, and especially love that I don't have to worry about storing thousands of pieces of paper. I use a iPad remotely and I am able to upload the signed waivers once I have wifi. Cons: The app often freezes when I'm trying to upload the waivers that were signed and stored on my iPad. Overall: My business is operated at the beach, so I love the fact that I can access and store waivers without needing wifi. WaiverElectronic is a simple, low cost tool that we use everyday. Pros: This software gives online bookings an opportunity to fill out waivers before they arrive and which is great for large groups. Cons: WaiverElectronic had a google play store app but it doesn't update correctly on the Fire tablets we use. We have to re-download the app every once in a while to make it work correctly. Overall: We use WaiverElectronic along side paper waivers in the business to accommodate all guests preferences. Pros: Very affordable and easy for a startup business on a shoe string budget. Cons: Was not easy to transfer contact information collected and transfer into mail chimp or our booking software. Pros: It's fairly easy to use /intuitive for customers once it's all set up. Cons: It's not super clear how the content pieces will show to the end user when setting up. I've had to make a few revisions after seeing it from the customer's end which requires a bit of back and forth. Overall: I own an escape room and need a waiver signed before guests enter, I also use it to collect email addresses. Cons: it seems a little dated! i would maybe revisit the aspect with minor's signing waivers. it's a little weird. Pros: It is simple to use and saves tons of paper. I also like that you can make multiple user accounts. Cons: I have no complains about the software, it does what it says it will do. Pros: I really like the ease of use and the great price point. Cons: There wasn't anything that I would say is a con. Overall: Client love it and it is easy to use. Pros: It's easy to use, the app works well. Easy to edit if necessary once the main body work was done. Pros: That it sinks right away. Easy to use for customers. Cons: Takes a while to load. Pros: I like the lower cost of htis service compared to others. I also submitted a request for a change and they made it happen in only a couple days! Cons: It was not as convnient for finding minor's names, but they fixed it! Pros: I own a sporting facility and the ability for parents to sign the waiver before they bring their kids to play is something they really appreciate. Cons: The section where it asks whether or not you are an adult is a little confusing. Pros: The customer service was fantastic. If I didn't know how to do something they would answer quickly to help. When I had a request for a new feature they would bring it up at the next meeting and get back to me on when it could be added. Cons: It is a little bit clunky to create the waivers and sometimes the app would freeze while trying to fill out a new waiver. 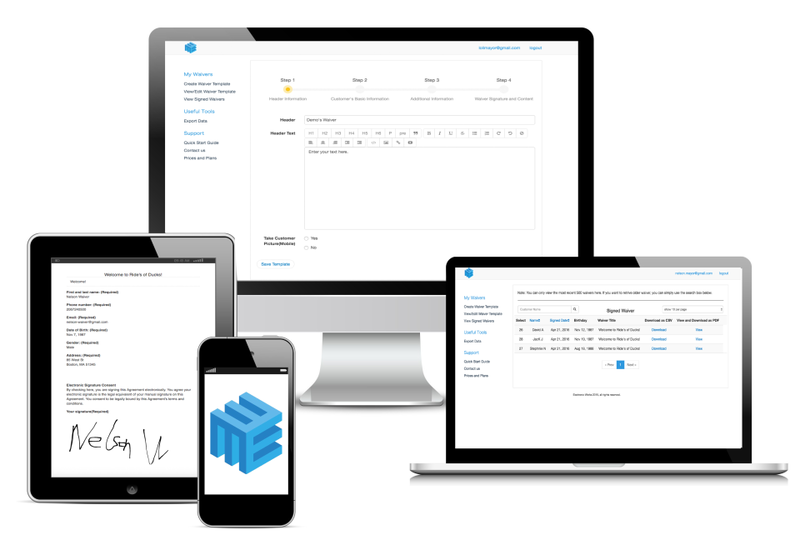 Overall: Overall it is a great product that helps eliminate paper waivers and keep all your waivers stored for you. I like their pricing model which is based on how many waivers you fill out per month. Pros: Ease of customizing, templates, emailing capability. Cons: The least avorite aspect was the use of the app. Pros: Great system. With waiver electronic we were able to move our slow legal process from paper to self service kiosks and improve check out times by a huge increase in time. Cons: Hardly a con but the website could provide more options and flexibility to customize additional features and better control the waiver app. New updates seem to be improving in time. Overall: Overall excellent experience. We use waiver electronic to run self service kiosks and print tickets. Its simple, it works, its stable. Doesn't require knowledgeable staff to maintain. Cons: I don't really have anything that I didn't like. Pros: I love how user friendly it is! Customer service is also amazing, they helped me convert our original waiver into an online friendly form! The offline feature is also amazing for when there's no internet. Cons: I don't have anything negative to say about this software. 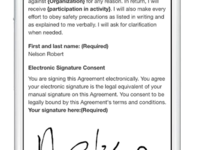 Overall: WaiverElectronic has helped us save so much paper by converting our clients to signing online. We really enjoy using it, and recommend it to other business owners :). Pros: I was so tired of the stack of ten different waiver forms for my salon sitting on the desk. We would run out of them at the worst times and then I had to store them for a year. This is so easy and much smarter. Cons: Cant say anything at this point. To easy to not use. Pros: It does what it's intended to do very well, from the ease of upload of the waiver, to the filing forms and their access by iPad/iPhone, to their ease of downloading the data. Cons: Generally speaking, it's always appreciated when one has the ability to reach customer service via phone, though thankfully there weren't many troubles with Waiver Electronic that required us to do so. Pros: The flexibility of designing forms. The ease of connecting documents. In order to load the new forms on app, please click "Settings" button located at the top right corner of the App, then click "Synchronize Data". Please try it and let me know if that works for you. Pros: App is very easy to use and convenient. I feel like it's worth the money too. Cons: Nothing really stands out as a "con" to me. Thank you so much! We will continue to work hard and improve the waiver service. Pros: It was very easy to set up, and it is easy to check that waivers have been submitted. Cons: Nothing, it's great! I haven't experienced any issues. Overall: We used to send hard copies of waiver, but with waiver electronic, it is much easier to make sure we get all waivers signed ahead of time, and it is much easier to save them all in one place. Pros: Always ready for my clients and easy to use. Cons: I wish it were a few more features in the software. Sometimes signs me out. Pros: Streamlined my check in process, making it easy and fast. Saves me time and ink, not having to print everything. Cons: 1. Would like to add notes in the app instead of having to go to my computer. 2. MANY People get confused at the end not understanding when it's complete. Pros: Easy of use. It was so easy to set up and keep all of our records up to date. Cons: I can't think of any cons. We have not encountered any. Overall: We require waivers for everyone that utilizes our facility. With this program we were able to automate and get rid of all of our paper documents. Pros: I love the ability to customize the templates to my business' specific needs. Cons: The simplicity gets lost at times while trying to figure out where forms get saved. Pros: I like that there is the option to customize the waivers and that they are stored on the server so I can access them. I appreciate not having to worry about losing important paper documents. I feel that the e-documents are up-to-date and easy to use. Overall: We are satisfied with this service and I like that we can ensure that our clients know and understand our policies. Overall: Still not sure because we haven't had a chance to use it with clients. Wanted to have everything updated before December (which is our busiest month) but couldn't because of customer service issues. So everything got delayed and we are already paying for a service we don't know if we like. The delay made us go over our free trial, so hopefully they will help us better in the near future and we won't have to cancel the subscription. Pros: Easy setup and okay templates. Easy to add or take away features. Pros: I like how easy it is to use and its look. Cons: I did not like the fact that I couldn't somehow fuse it into my website. Cons: It's not intuitive. I have trouble retrieving information from this platform. I had to make my clients input their information multiple times on my iPad before it would save the information. Overall: This product solved my initial problem of transferring my paper contracts to a digital platform, Thanks. But, I just need to be able to retrieve information form my iPhone and iPad with greater ease. Pros: It looks professional, I like it way better than paper forms for that reason and space saving. Cons: It wasn't very easy to insert bulletpoints, I put them in and it erased them. Pros: I love that it took no time at all for me to figure out how to set up my waiver intake for my events. If you've ever filled out a form online, then you can set up your waiver with this app. You can drag and drop certain blocks of text and signature fields, and there's also some cute background image options to help customize your waiver. Best of all, your waivers are stored electronically, so no paper waste! Cons: It's kind of a bummer to pay for this service, but the price isn't insane and well worth it if you'd like an efficient way to electronically gather and store your waivers. Pros: Waiver electronic is easy to use and affordable. Cons: I would like a field that adds and subtracts to give totals to my clients. Overall: Overall, waiver electroic is easy to use and easy for my clients to use. I rate this waiver company 9 out of 10. Pros: The software is very easy to setup, which allowed more time on other responsibilities I have. I love how it automatically sends the waivers to google drive. Cons: If you have waivers fille out prior to connecting it to google drive then you have to manually move those waivers. I would also like to see a link to adrive. I have to maintain another cloud based service since it can't send the waivers directly to adrive. Overall: Great software that helps make the club registration process easy on all parents.